Enter your commander’s name to start the game. Move around in the space and shoot everyone and each and every thing that hinders your way to reach the top of the score board. Collect plasma on the map to make your ships bigger because bigger ships are stronger and less likely to be defeated. 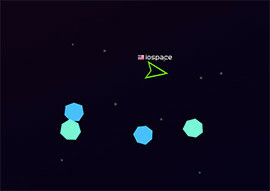 The space is full of asteroids which are huge rocks, shoot and destroy them to power up. If another online player is chasing you, you may shoot him but if his ship is bigger, you can run away fast by using a boost. You can shoot power full missiles too. But missiles will take time to get filled. But laser bullets can be shot at any time. A mouse and a keyboard of computer or Laptop, both will be used to play this game. Use your mouse to aim and click left to shoot the laser. Click right on mouse to accelerate the speed of the space ship. Press “W, A, S, D” to move the space ship. Press Q to boost and E to shoot the missiles. Copyright © 2019 iospace.games All Rights Reserved.